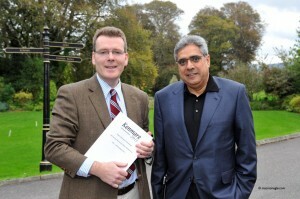 Pictured at the 34th Annual Economic Policy Conference that took place in Kenmare, Co. Kerry (14-16 Oct 2011) are Pat McCloughan of PMCA Economic Consulting and Ajai Chopra of the International Monetary Fund (IMF), who both spoke at the conference. In his keynote address to the gathering, Ajai Chopra highlighted the need to fundamentally overhaul Europe’s financial stability architecture as a matter of priority. “Modest reforms are not sufficient in the current environment. The crisis requires convincing skeptical markets that Europe can make bold and unified decisions”, he concluded. Ajai’s speech is available here. Dr. McCloughan addressed the competition policy implications of the Irish government’s re-structuring of the Irish banking sector. “The pillar banks”, he said, “could (inadverently) lead to a situation of an over-regulated banking sector characterised by weak competition, in which consumers and small business will lose out”. He proceeded to recommend that the authorities keep a watchful eye on the situation, from a competition and consumer welfare perspective, as well as from a financial stability viewpoint. His paper is based on the July 2011 PMCA Economic Commentary, which gave warning to these risks (available here). 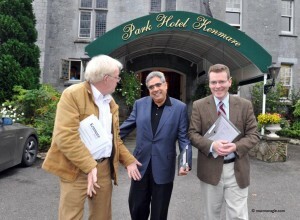 The picture below shows UCD economist Colm McCarthy in conversation with Ajai Chopra and Pat McCloughan at the Kenmare conference. The picture also appeared in The Irish Times on 15 Oct 2011.